Superchargers are basically fast chargers that can charge up one of Tesla’s Model S cars in around 30 minutes (depending on how low the battery is). The idea is that because the market for electric cars is so new, there isn’t enough charging infrastructure out there to enable EV drivers the comfort of driving wherever they want, whenever they want — like taking a road trip up and down the state. “Range anxiety is real,” said Musk at D11. That’s why Tesla has become an infrastructure provider as well as a car maker. The chargers have solar panels on them from Musk’s other company SolarCity (s SCTY), and Tesla has been building out the chargers along well trafficked long distance highways. Until now most of the Superchargers had been installed on the coasts. But back in September 2012 Musk had said that within two years he wanted the U.S. to be covered in Superchargers. Tesla also wants to build them in Europe and Asia, too. 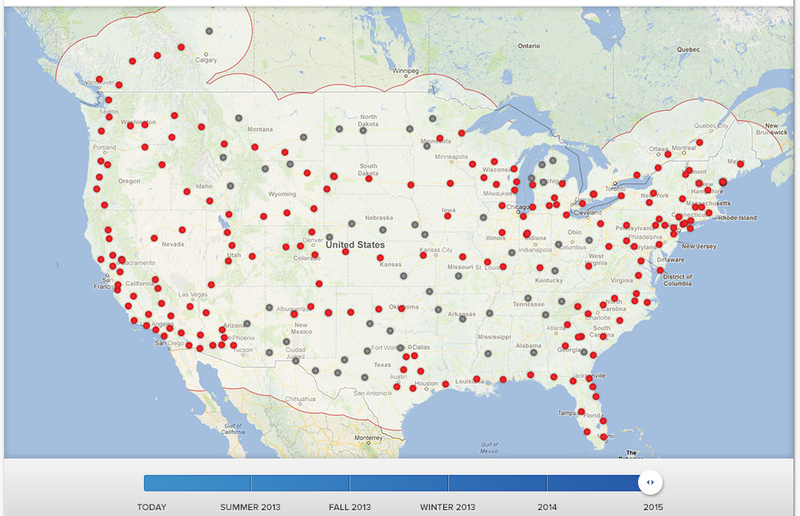 Currently Tesla has eight Superchargers, mostly in California. By the end of June, the count will have tripled, according to a Tesla press release issued Thursday. California will get more Superchargers, along with spots “from Vancouver to Seattle to Portland, Austin to Dallas in Texas, Illinois and Colorado.” Locations will also pop up on the northeast corridor and in Florida. 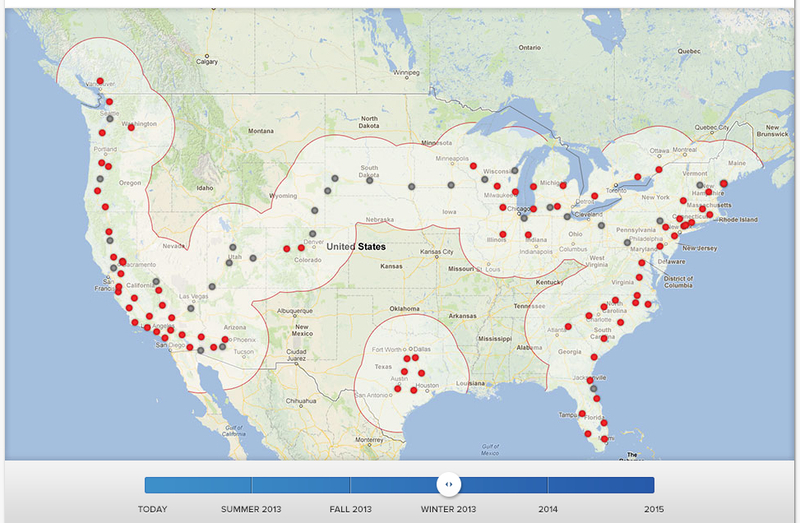 The Supercharger network will expand further over the next year to span the width of the nation, “covering almost the entire population of the U.S. and Canada,” according to the press release. More stations will come online later in the United States and Canada, with more than 200 stations planned in North America. Musk also announced that the maximum charge rate at Superchargers will increase from 90 kW to 120 kW. As a result, a Supercharger-enabled Tesla Model S could get two-thirds of a full recharge in a little over 20 minutes, Musk said. With free energy for life drivers will make more miles and use more energy. That’s ok when all the energy is green, generated bij wind or sun. It would be perfect when Tesla would place windturbines or solar cells together with the superchargers. Free for live energy? People will make more miles! I really hope all the energy will be generated green? Most beautiful would be if Tesla would place a windmill or solar cells at every station to ensure green energy. @Ap; The half charge will be the top half of the battery charge normally. Even if the driver waits for the charge to be near the last spark of battery energy, the 50% charge will still be quick. Also, as far as a 3 minute fill up at a gas station… I drive for a living and can tell you; a 10 minute fill is fast at most gas stations because of slow pumps and poor card readers at many stations. Don’t forget bathroom breaks, snack purchases and slow lines inside the store. I know several Prius owners. They ALL LOVE their Prius’. If they had the money for a Tesla most would upgrade. Just a matter of time until states start charging a use tax on electric cars to fund highway repair. Current combined fed/state tax runs from 40 to 70 cents per gallon of gas. States are looking at ways to recover this tax from electrics and feds will start taxing when electric penetration get high enough. Enjoy the free ride while you can. I wonder if there will be any community funded stations? Tesla can go 300miles on a full charge. What kind of car do you know of that can drive double that to 600miles on a full tank of gas?? What do you drive an oil tanker? Its a free charge with Tesla, better than spending $60-70 on a full tank of gas. Lots of cars. BMW X5 diesel. Audi Q7 diesel. 25 gallon tank x 25 mpg. Not that unusual. You are right in saying that a car that can go 600+ miles is not that unusual… but as Joe mentioned, the really unusual and -please allow me- disruptive proposition here is to travel for FREE for LIFE! When will AUDI, BMW or anyone else for that matter will be able to offer that???! And even if anyone did…. they would just be the SECOND company offering it! In a 100+ year-old industry, it’s not quite usual to be this disruptive! It charges a HALF charge in 30 minutes. A full charge is over an hour and has half the range of a typical car’s tank. So what takes 3 minutes for a gas car takes >2 hours for a Tesla. The 30 minute thing is marketing spin.